Welcome to my Frequently Asked Questions section. This page contains answers to questions not only about me but also about clocks in general. I appreciate your interest and hope that you find what you need below. If you have any further questions, please do not hesitate to ask. How did you get started in clock repair? How did you learn clock repair? Did you receive any further training? Tell me about your clock repair experience. Why are you called a clockmaker if you do not make clocks? Should I replace my worn clock dial? Should I refinish my clock case? Why is my modern clock worn out already? Which brand of new grandfather clock is the best to buy? This is without a doubt, the question I am asked most frequently. So, for all who are interested, I am happy to give the "long" answer here. Like I heard someone say once, "I'll be brief, no matter how long it takes." I was born in Columbus in 1960. My father was in the Air Force stationed at what was then called Lockbourne Air Force Base. Being a military family we moved quite a bit. After moves to several parts of California, New York, and Louisiana, my father retired in 1972 and we moved back to Ohio, which was always considered our home. I graduated from Groveport Madison High School in 1978 in the top 15% of my class. I had every intention of going on to college in the fall. I was contemplating architecture or accounting as a career. Life, however, had a different, and in my opinion, better plan. I took a summer job with a local clock retail store where I delivered and installed grandfather clocks as well as doing stock work, etc. Fall came and went and yet I continued to work at my "summer" job. I guess I enjoyed what I was doing because winter, spring, summer and fall kept coming and going until before I knew it three years had passed. My "career" as a clock delivery boy was going nowhere fast. During this time I married my high school sweetheart, Candy. Fortunately for me, early in 1981 I was offered the chance to begin training under the clockmaker who worked for the retail store that employed me. I must admit that I did not grow up dreaming of becoming a clockmaker, but the idea was fascinating. I always enjoyed working with my hands. My interest in art, model building and history seemed to dovetail very well into a career in clock repair. Not to over romanticize it, but I have always felt that clock repair is an art form, especially when restoring a well made antique movement. A detail oriented mind necessary to be a good model builder has been a real advantage. Also, many of the clocks I was to repair, being antiques, added an historic aspect to what I would be doing. With these things in mind it did not take long to decide. In May of 1981 I began an apprenticeship that was to last for five years. During this time I learned all aspects of the repair of grandfather clocks, striking and chiming wall and mantle clocks, cuckoos and anniversary clocks, whether antique or modern. I continued to work with my teacher until 1992. Because of this there was always someone there to correct me if necessary and help me when I needed it. Even though the apprenticeship was over after five years, the training never really ends. I eventually left my employment with the clockmaker who trained me and set off to begin my own business. In 1994 Master Clock Repair was born. Soon after this, instead of thinking I had learned all there was to know about clock repair I began to seek out ways to continue my education. I believed that I had already received excellent training, but I reasoned that if I did not expose myself to other clockmakers I would never know what I didn't know! My first stop was to renew my membership with two clock related organizations, the NAWCC (National Association of Watch and Clock Collectors) and AWCI (American Watchmakers Clockmakers Institute). The NAWCC is geared more towards the collector and the clock historian, where as AWCI's main focus is to serve the working professional and enhance the skills of all who practice either trade. (AWCI welcomes clock and watchmakers in all skill ranges.) Both of these organizations send out informative publications each month, with articles on clock histories and proper repair procedures and tips. Along with these publications I stay current by reading major new clock repair books. By exposing myself regularly to this material I am able to compare and sometimes contrast my techniques with those of others. Between 1995 and 2010 I attended five different continuing education seminars, at my expense, sponsored by AWCI. Each time I registered I wondered whether it would be worth my time to go but each time I was glad I attended. Most of what was taught I already knew, but there was enough new "revelation" to make it worthwhile each and every time. In addition to these two day courses I have also attended three short courses at each of seven national conventions I have attended and have taught at two of them. From the time I entered the trade in 1978 and up to 2011, I conservatively estimate that I have set up, repaired, restored or serviced over 33,000 clocks, including having made over 18,500 house calls. I have repaired all types and makes of antique clocks, from Early American and English tall case clocks to Howard Banjo's, from Chelsea Ship's Bell clocks to Vienna Regulators and from the common modern grandfather clock movement to the large antique, high quality tubular bell clocks by Winterhalder, Herschede and others. I have restored 250 year old Morbiers as well as clocks with wooden movements made in the early 1800's. I have been an authorized service agent for Howard Miller the whole time I have been in business. Certification is obtained from The American Watchmakers Clockmakers Institute, the premier trade association for working professional watchmakers and clockmakers. As of July 2010, there are approximately 137 clockmakers nationwide who have obtained certification through this organization. There are only six, including myself, currently working in Ohio. Over the last five years (2005-2010) I have served on the Education Committee at AWCI. Only experienced, professional, full time Certified Clockmakers in good standing were selected to serve on this committee. During this time we wrote the first ever Standards and Practices Document detailing the proper methods for clock repair. Once this document was complete we developed a new test based on these standards. The new certification title is "Certified Clockmaker of the Twenty-First Century" or CC21 for short. The title was changed so that there would be different title to show which certification a person holds. After completing the work on this test I was awarded that very designation. For much more detail on certification see our What is Certification page. Many years ago if you wanted to buy a clock you could not go to the local clock store. There weren't any! You went to the local clockmaker and commissioned him to make one for you! Prior to 1800 clocks were not made until someone had already agreed to pay for it! Quite naturally, if you already owned a clock that was not working properly you would take it to the "clockmaker" to have it repaired. Out of tradition, even today when there is no need for clocks to be made individually, the person who repairs clocks is still called a "clockmaker". I cannot answer this question specifically, since each clock and clock owner is different, but I can share with you, what I feel is the best way to come to a decision. There are two kinds of clocks we will consider here. The first type is a clock that has no emotional value to a person at all; it is simply a functioning clock that no longer works. In this case, the replacement value of the piece should factor into the decision. If the clock is going to cost as much or more to repair than it is to replace, you might as well replace it. An honest clockmaker will inform his customer when this is the case. The other kind of clock is one that has either been passed down to its current owner through a family member, the current owner intends to pass it on to their children or the clock holds some special sentiment or meaning to the individual. In this case the most important factor is not its replacement value, but its emotional or sentimental value. Because this type of clock is "one of a kind" and essentially irreplaceable, it is well worth whatever the cost of a proper repair would be. Most of the time when dealing with a quality clock, even a complete overhaul of the clock movement is going to cost less than the clock's actual value. On some of the more common antique clocks the cost will frequently come very close to or perhaps be a little more than its actual value and the more unusual or rare pieces will have a repair cost that will fall well below. Unless the clock has been purchased for "investment" reasons or for resale, the clock's emotional value should be considered first. Beware of those clockmakers who feel it necessary to inflate unrealistically the value of the clocks brought in for repair in order to justify their repair costs. It should not be necessary to do this. If the repair is being done in a proper manner by a professionally trained repairman whom you trust, and you love your clock, it is well worth the cost regardless of what its resale value might be. Many early American clocks had dials that were nothing more than a printed piece of paper glued to a metal dial pan. As these paper dials aged many of them have become extremely dirty and or worn badly. Many times the customer will ask whether anything can be done about this and if it will affect the clock's value. The first thing I do is ask them if they are planning to sell the clock. If they are not, then the value of the clock after a dial replacement is really not a factor. In the case of most common clocks, if the value of the clock is an important consideration in making the decision to replace or not, I will usually tell them that they have lost either way. If the clock's dial is in bad enough condition to consider a replacement then some of the clock's value is lost already. Whether the dirty, badly worn dial is left in place or the dial is replaced, when it comes time to sell the clock, the purchaser will likely want to pay less either way. If the purchaser is an investment style collector he will be less interested either way because he will only be looking for clocks in original and mint condition. Therefore, unless the clock is rare or has great antique value I tell them they should do what they think will please them the most when they look up at their clock sitting on the shelf or hanging on the wall. For examples of paper dials that have been replaced, painted dials that have been restored or metal dials that have been refinished look at my Before and After page for Clock Dials. Should I refinish my antique clock case? The answer to this question is essentially the same as the last one. However, I'll add this. Many people now watch the "Antique Roadshow" on TV. They have heard the appraiser's comments about how a particular item's value has been diminished due to refinishing. This certainly can be true. A very rare piece is often worth more even if the original finish is in very bad condition. Notice I said very rare! Most clocks that people are bringing in for repair and considering the "refinish question" have clocks that are only worth several hundreds of dollars and although quite old are not rare at all. Frequently, the antique furniture in question on the "Antique Roadshow" is worth thousands and thousands of dollars, not a few hundred. For most of my customers, the sentimental value far out weighs any antique value. Therefore they are repairing, refinishing and or replacing dials for their personal satisfaction, not for some future investment return. Each clock owner must decide this question for themselves. I never suggest that a customer should refinish or not refinish. I give them the information and options and let them decide. For examples of clock cases that have been cleaned and or refinished please look at my Before and After page for Clock Cases. Many clock owners are shocked to find out that their fifteen to twenty-five year old clock with a German made movement is worn out already. I have even seen a few that have worn themselves out after only seven or eight years. Fortunately this is rather rare. Most of the modern era clocks that I find myself having to overhaul or replace fall into the other age range. There are two main reasons why this becomes necessary. The first reason is that many clock owners neglect to properly maintain their clocks. My recommendation is that this be done about every three years. You should not wait for the clock to fail before you think of having it serviced. The longer the clock runs without lubrication the more wear will occur. The second and perhaps biggest reason is, "They just don't make them like they used to." Everyone gets tired of hearing this but it is true for clocks just like it is for many other mechanical items. It hurts more when it comes to clocks because a great number of clocks produced long ago were built to last 100 years or more. In this modern age the consumer's demand for lower prices has caused the large clock manufacturers to find ways to produce clocks for less money. Because the large clock case manufacturers are the biggest customers of the movement manufacturers they are able set the price they are willing to pay. After all, they are buying thousands of movements at a time. Once the case maker sets a price the movement maker must find a way to produce them in a way that remains profitable for him. In order to do this he may use cheaper material, whether it is brass or steel and sometimes plastic to make the various components for the clock movements. This results in decreased durability. In spite of this, these modern German movements are still some of the best being produced today and the cost of repair or replacement is normally well below the cost of replacing the entire clock, case and all. Because of this, most of the key-wound and weight driven clocks being produced today will still be around for along time to come as they are passed on to future generations. For a more detailed answer to this question be sure to read my full article called "How to Buy". The quick answer is that no brand is necessarily better than the others. Within a given price range the differences will be minimal. The reason this is true is because the various different brands are for the most part using essentially the same quality of movements in their cases. Where the difference usually occurs is in the quality of the cabinetry. In the right price range (usually $2000 and up) any clock made by any manufacturer will usually have a quality case. Spending more money on a clock does not mean that you get a clock that will last longer. What you get is a nicer case finish, more expensive wood and or inlays, beveled glass, gold trim, better quality dials, larger fancier pendulum, engraved weight shells, lights, more movement features etc. The durability of the mechanism itself may be marginally better but not enough to make it the most important consideration. The larger movements in these clocks are often a sight to behold and look far better than some of the smaller ones. However, also remember that when it comes time to replace that movement the cost of doing so will be much higher. Do not buy a clock without knowing that you will have to replace the movement eventually, usually in the 20-30 year range. Unfortunately there are far fewer manufacturers to choose from then there was 20 years ago. Many clock companies have either quit manufacturing or have gone out of business all together. If you go shopping for a clock locally chances are all you are going to see is Howard Miller and maybe Ridgeway (Ridgeway is owned by Howard Miller). Generally, these are good clocks, but it will also be what everyone else has. For the benefit of internet search engines I answer the above question. Most of my business is from the Central Ohio area but I have repaired clocks from other states as well that have either been mailed to me or brought on special trips. I have even made house calls to Kentucky and West Virginia. Master Clock Repair serves Arlington, Ashley, Athens and Ashville, Ohio. Master Clock Repair serves Bellefontaine, Bexley, Bremen and Buckeye Lake, Ohio. Master Clock Repair serves Circleville, Canal Winchester, Cambridge, Coshocton, Centerburg and Chillicothe, Ohio. Master Clock Repair serves Dublin, Delaware and Dayton, Ohio Master Clock Repair serves Granville, Groveport, Grandview, Gahanna and Galena, Ohio. Master Clock Repair serves Hebron, Heath and Hilliard, Ohio. 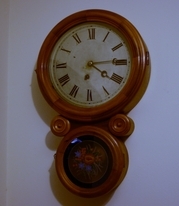 Master Clock Repair serves Logan, Lancaster and London, Ohio. Master Clock Repair serves Mount Vernon, Marysville and Marion, Ohio. Master Clock Repair serves Newark, New Albany and New Lexington, Ohio. Master Clock Repair serves Obetz and Ostrander, Ohio. Master Clock Repair serves Powell, Pickerington and Plain City, Ohio. Master Clock Repair serves Somerset, Sunbury, Sugar Grove, Springfield and South Bloomfield, Ohio. Master Clock Repair serves Worthington, Westerville, West Jefferson, Washington Court House, Whitehall and Waldo, Ohio. Master Clock Repair serves Reynoldsburg, Thornville, Johnstown and Zanesville, Ohio.